Audet & Partners, LLP is investigating potential claims on behalf of veterans who used Combat Arms earplugs manufactured by 3M and subsequently suffered from tinnitus and/or hearing loss. In July 2018, 3M agreed to pay $9.1 million to resolve claims that it supplied defective earplugs to the United States. The 3M earplug lawsuit alleges that the 3M earplugs were defectively designed insofar as they were too short for proper insertion into the users’ ears, and hence were prone to loosen and dangerously expose many users to hearing damage. The Combat Arms earplugs were designed to provide two levels of hearing protection, “closed” or “open” settings that could allow for limited ambient hearing. The earplugs were originally created by Aero Technologies which was later acquired by 3M in 2008. 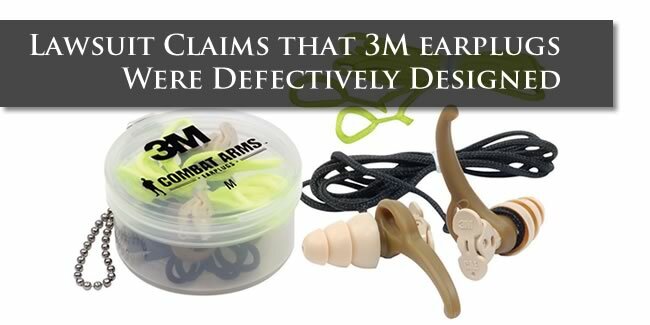 It has been alleged that Aero/3M employees were aware of the alleged design defects in the Combat Arms earplugs as early as 2000, several years prior to the time at which 3M became the exclusive provider of earplugs to the military. If you were issued or purchased 3m Combat Arms earplugs, were exposed to loud noise when using the earplugs, and have since been diagnosed with hearing problems, you are urged to contact a product liability attorney at Audet & Partners, LLP for a free, confidential case evaluation. You can contact us either by completing and submitting the inquiry form on the right side of this page, or by giving us a call at (800) 965-1461.